Preserve the life of your tyres as much as possible by ensuring that your wheels are aligned accordingly, which will also enhance the comfort and all round driving experience for you and your car. Wheel alignment can minimise the possibility of uneven tyre wear and improve the overall handling and therefore safety of your car. 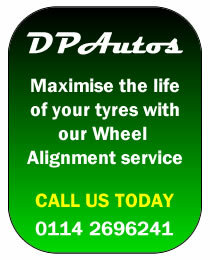 If you have any doubts or wish to book your car in for wheel alignment then call DP Autos today on 0114 2696241.